I learned a lesson today: Be at Obedience matches and trials much, much earlier than I think I have to. You’d think that after the nightmares I’ve had about dog shows, I would already have internalized this lesson. This morning I was scheduled to run in an Obedience fun match put on by the Sherwood Dog Training Club. 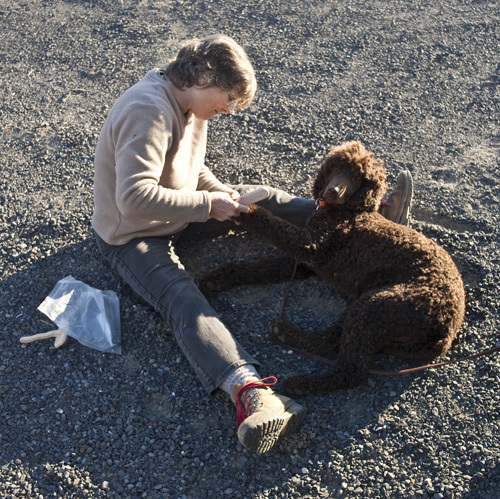 I try to go to as many matches as I can — they are the closest thing to a real Obedience trial you can get. But because they’re fun matches, and not real trials, there’s all sorts of things you can do in the ring. You can re-do exercises, correct your dog, give treats, play with toys, whatever you need to do to help your dog and yourself learn all the right moves and behaviors. For this match, I thought I’d given myself a 1/2 hour buffer. I counted the number of people scheduled to run ahead of me in the Novice class, multiplied by 6 minutes per run, added that to the start time, and planned to be there 30 minutes earlier than the resulting time. But reality interfered. As if often does. I’d forgotten my entry fee money, and had to stop at a cash machine. That added 10 minutes to my travel time, leaving me with being there just 20 minutes ahead. And then, it turned out that about 4 people who were supposed to run before me were missing, and that right there equals about 24 minutes, putting me now 4 minutes behind. And then, some of the people ahead of me were faster than expected, adding probably another 3 or 4 minutes to the time hole. Being kind and resourceful people, instead of eliminating me from the run order, some fellow club members filled in ahead of me. And when I walked in the door, I discovered that the person ahead of me was already almost through her run. That gave me only about 1.5 minutes to get my dog out of the car, persuade him to pee outside, and be inside at the ring gate. Gagh! I’m usually a very responsible, on-time type of person, so this is completely embarrassing. I hope it’s sufficiently embarrassing that I won’t do this again. Reality can bite in just these same ways at real trials, too. I guess I can just be glad that I had an opportunity to learn this at a fun match, rather that at a real (and much more expensive and less forgiving) Obedience trial. 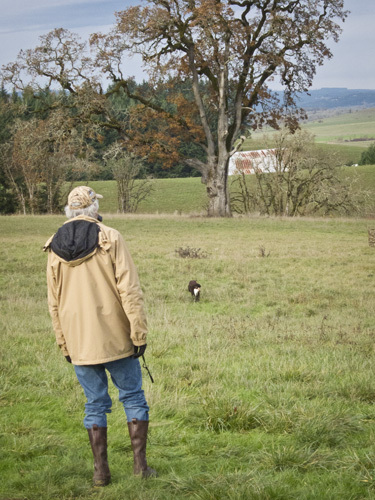 Who would have thought that, after a week with 6 inches of dark, soggy, horizontal rain, we would get perfect weather, in a perfect setting near Monmouth, Oregon, to do some hunt test training? Any opportunity to train with a group is wonderful, but to do it in these conditions is truly a gift to be thankful for. 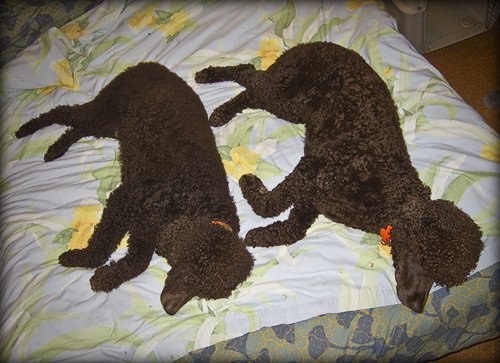 Both dogs are sort of rusty at the work. I’ve been able to take Cooper and Tooey out a couple of times in the last month, but neither time has Russ been able to go. Russ and Cooper are the good team, and when those two work together, it’s a real pleasure to watch, even if they are rusty at it. Today we tried a triple with Cooper. 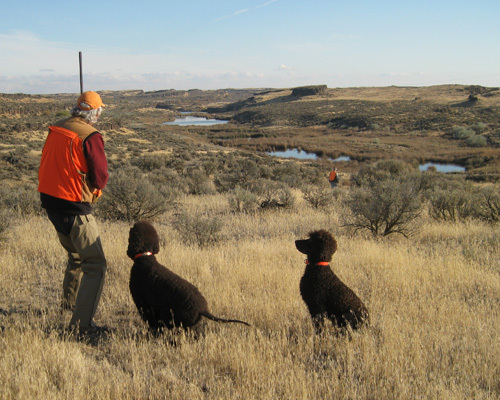 That’s when the dog sits with his handler to watch 3 birds go down, and then goes out to pick them up and bring them back, one right after another. Cooper has done a triple before, but not at these distances (about 150 yards or so). Cooper did really well on his first two birds. On that third bird, he needed a bit of help to remember where it had fallen. 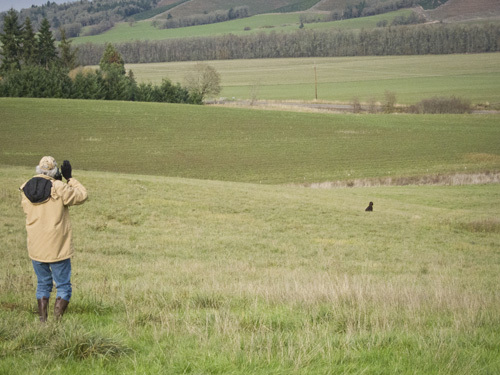 Since I had thrown that bird for him, I walked out of my blind and into the field, waving my arms as I moved toward the area of the fall. Seeing that motion perked up Cooper’s memory, and he found the bird and brought it back to Russ. That’s one thing about Cooper — he always brings back his bird. 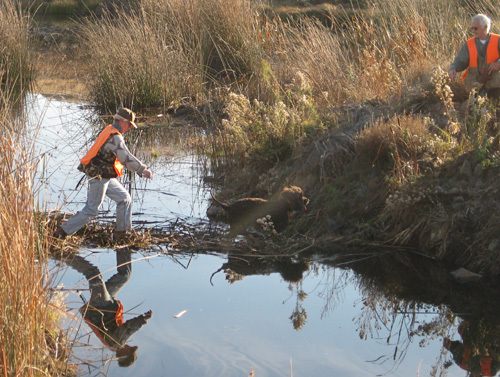 We worked on some blind retrieves, too. 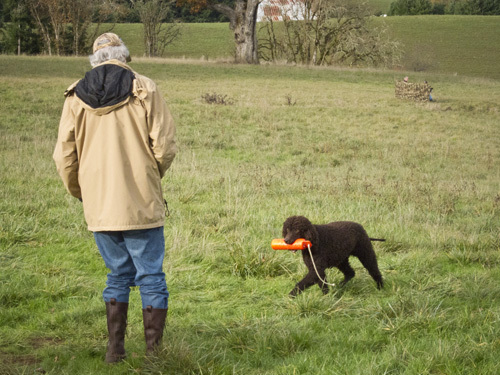 That’s where the handler lines the dog up, pointing him in the direction of a bird (or, in this case, bumper) which the dog hasn’t seen fall. 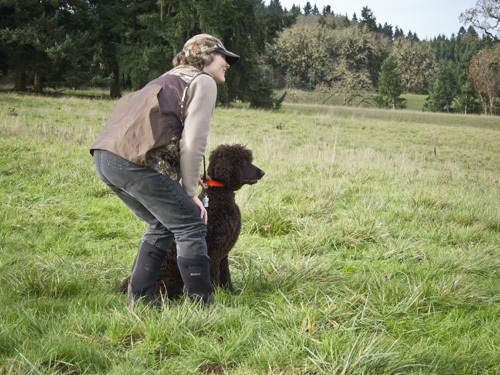 On a blind retrieve, the dog has to go out on faith, and follow the handler’s whistle and hand signals to direct him to the bird. Coop’s rusty at this, so today’s practice is just what he needed. Tooey and I got some training in today, too. 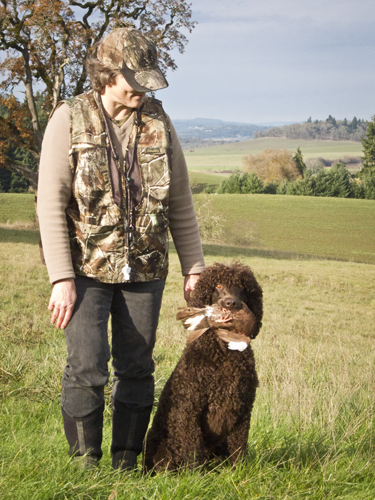 With Tooey, I still go into training sessions with the question in my mind — will Tooey pick up and bring back her bird? She marks the fall of her birds well, but she doesn’t always find them on the ground right away. That’s not uncommon for a “junior” dog. But she’s also had some episodes where, even after she’d found her bird, she wouldn’t pick it up. And a couple of times, she’s found it, picked it up, brought it part way back, but then dropped it and wouldn’t pick it up again. So, lots of challenges. But thankfully, even with all that, today we had success. Tooey found all her birds (mostly frozen ducks), picked them all up, and brought them all back. Not surprisingly, the flapping pigeon was her favorite, much more exciting than frozen ducks. And she brought that pigeon back alive and unhurt, fit to serve another day. Good girl! I want to thank Jim Davis of Oakhaven Labradors for his advice and access to this wonderful spot and equipment today. And also thanks to Hank, Donna, and Pat for throwing birds for Cooper and Tooey. Cooper has been prescribed so many medicines and supplements to treat his SLO: tetracycline, niacinimide, fish oil, vitamin E, biotin. Plus, on the advice of some other owners of dogs with SLO, I also give him super vitamin B complex and biotin. Now, the supplements won’t hurt him. In fact, lots of dog owners give their dogs fish oil for their omega-3 fatty acids, which are excellent for a dog’s coat. Though at 6 capsules per day, Cooper gets quite a bit of fish oil. But the tetracycline — he’s been getting a 500 mg capsule of tetracycline, 3 times per day, for almost 3 years. That’s a lot. A lot. And it hasn’t been trouble-free. It’s really inconvenient to space out 3 doses of tetracycline so that it’s given as close to every 8 hours as possible. Sometimes it makes him nauseated. And because calcium interferes with the body’s ability to absorb tetracycline, Cooper can’t get food with calcium in it within 2 hours either side of taking the tetracycline. At his dosing schedule, that means almost no dairy — no cheese, which he likes, and no yogurt, which he also likes and which would also help restore the healthy bacteria in his gut that the tetracycline kills. I’ve been hoping for an alternative, but one that would not lead to a worsening of his SLO. Some inconvenience, a little nausea, and no dairy is nothing compared to the pain of SLO. Fortunately, yesterday my vet has suggested that we switch to doxycycline. It’s a “semisynthetic” version of tetracycline with some definite advantages. It doesn’t bind with calcium like tetracycline, so the vet has given his OK to give Cooper yogurt. And best, of all, its half-life is 18-22 hours compared to tetracycline’s 6-11 hours, which means that he only needs to take it two times per day, instead of tetracycline’s 3 times per day. And if all goes well, we might be able to reduce it down to 1 time per day sometime in the future. Subtitle: The hawk, the porcupine, and the beavers. Yesterday morning, our 2nd day of this trip, we walked through a field of grasses and thorny rose bushes, lines with small, cattailed ditches and culverts. 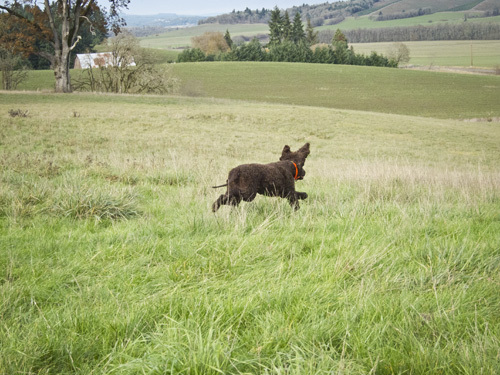 Cooper did a much better job out in this more open and somewhat flatter field. He ranged ahead of Russ and quartered the field, looking for birds. 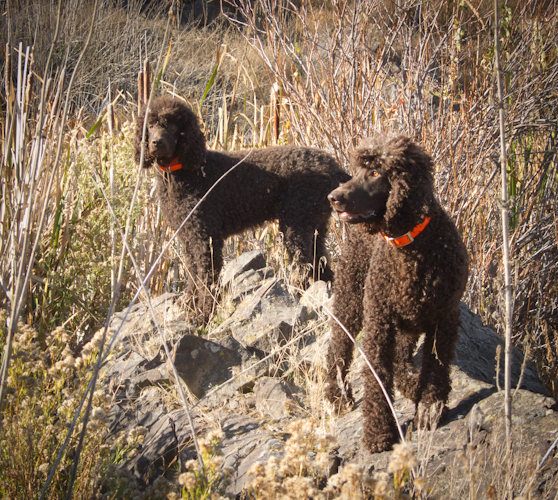 Rio did the same job for Rod, working out front, searching for birds. So after lunch, we headed over to the much prettier and more dramatic Upper Goose Lakes. 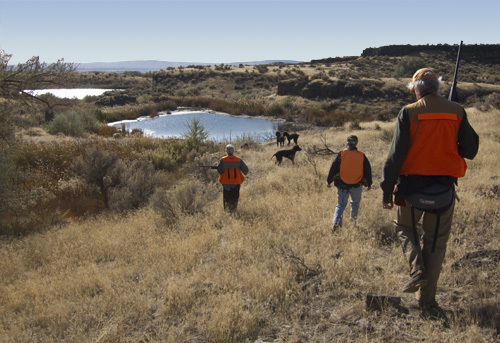 The terrain is much like what we saw Friday at Lower Goose — basalt cliffs, strings of small ponds, Russian olive trees, and sage brush — totally non-urban scenery. But the action was quite a bit more dramatic. The first incident was with the ducks and the goshawk. As were walking down the hill toward the first series of lakes, we saw ducks sitting in the water. So Rod, Renae, Russ and I quietly made our way down to the base of the canyon. Renae and I held the dogs while the Rod and Russ crept toward the lake, hoping to surprise the ducks. And surprise them they did. In a flurry of flapping wings, the ducks flew away from the two gunners, who got off several shots. All of a sudden, a goshawk swept in from nowhere and grabbed one of the ducks. In the hawk’s talons, the duck struggled in mid-air. After a few minutes, the hawk dropped the duck into another pond. We thought about sending the dogs after the duck, but by then, the duck had managed to hide itself in the cattails at the water’s far edge. That would have made a 200+ yard blind retrieve in cold water and then tangled cattails. We decided not to pursue it, and walked on. And then there was the porcupine. I wrote in my last post about Tooey’s love for the water. Whenever she disappeared, we could pretty much count on finding her in the nearest pond, stream, or culvert. So, when Tooey disappeared for the fifth time today, we knew where she was — in the pond next to the path where we were walking. 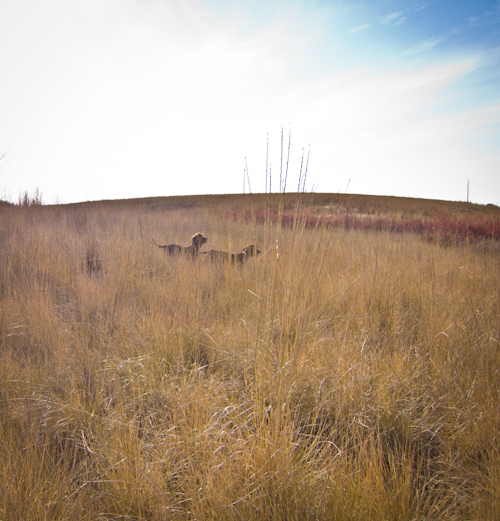 And as soon as we let her go, she charged right back into the cattails, determined to GET that porcupine. As they said in the movie, she’s got grit. I called her out. She didn’t come. I whistled her out, and for a moment, I thought I’d have to go in after her. But out she came, got her chicken jerky reward, and then looked back at the cattails, asking permission to go back in. “No. Leave it. Let’s go,” I said. She came with me, but whenever we came to a new patch of cattails, she turned her head toward them, telling me that that’s where she wanted to head. We saw lots of evidence of beavers. Renae found a beaver skull, and then Russ found the matching mandible close by. That came home with us, to be used in some future art project. We also saw lots of beaver dams. And had the benefit of being able to cross a couple of the ponds by walking on the top of a couple of the dams. They looked sort of iffy, seeing as how they were made out of cattails, but turned out to be amazingly sturdy. After several hours, we could see that the sun would be going down soon, so we headed back, sans birds. Toward the very end, Cooper started to limp. He’d gotten sore feet the day before, with the skin between the pads looking a bit inflamed. But we’d put some antibiotic protective cream on them and in the morning they’d looked fine. We’d put some more cream on his feet in the morning and again before our afternoon at Upper Goose. And all day, he showed no sign of discomfort at all, until that last climb back up the canyon sides to the parking lot. That’s when we saw how red and angry the skin between his feet had become. He spent the rest of the day resting, and rested again during the whole 6-hour drive home today. This evening, he’s limping a bit like an old man, poor dog. I’ll clean his feet with cool water, put some herbal lotion on them, give him some Rescue Remedy, and keep him quiet. If it doesn’t get better, we’ll be off to the vet. And in any case, I’ll have to see what I can do to prevent this from happening on our next hunting trip. Ending score? 14 pheasants flushed, 3 pheasant shot at, 1 pheasant hit, and 3 apples retrieved to hand. The dogs flushed up 14 pheasants. About half of those were roosters (you can’t shoot hens). The gunners shot at 3, and hit one. That one fell like a lead weight, right into the middle of some very dense, thorny bushes. 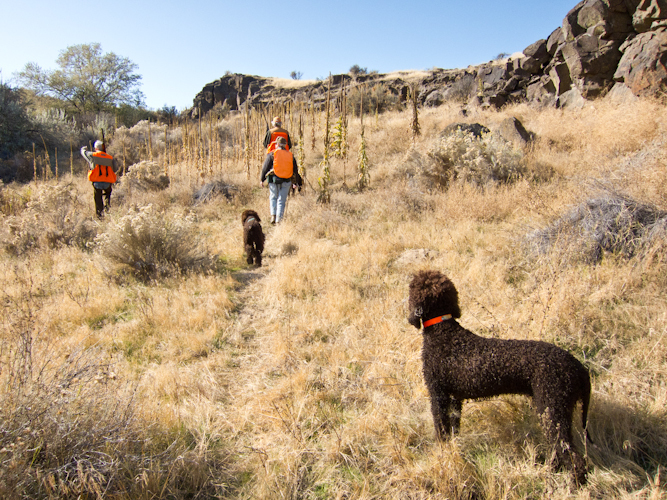 All four dogs and all four people searched, but none of us ever found anything resembling a bird. 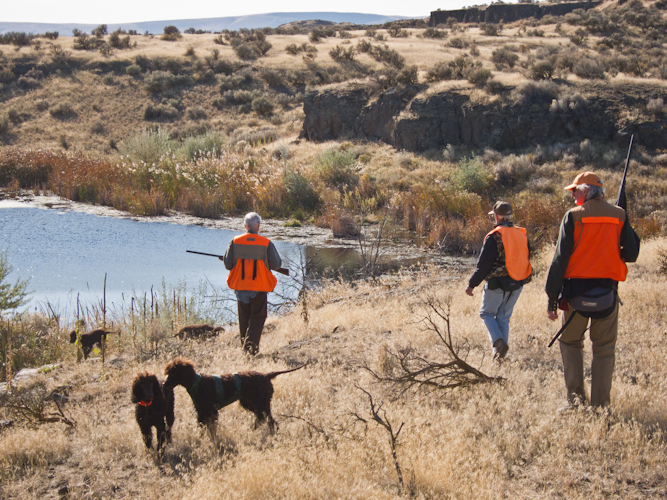 The dogs didn’t find the bird or its scent, and the people didn’t see any feathers or other evidence that a pheasant had ever been shot, much less fallen to earth. But fortunately, the scenery and the weather at Lower Goose Lakes were absolutely beautiful. Mid-40’s, blue skies with wispy white clouds, just a bit of wind, fractured basalt cliffs, glittering blue lakes, the scent of mint and sagebrush. Perfect for hiking. Rio did get one scent that really excited him. He dived into some heavy cover to grab his favorite — apples. He loves apples. 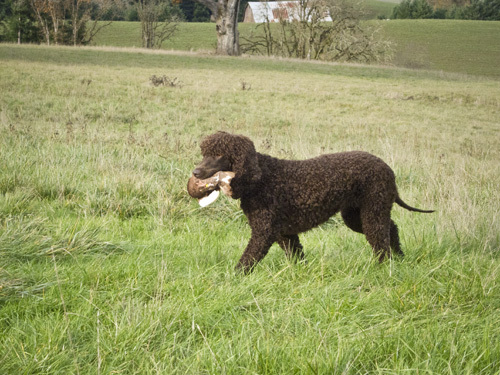 It was sort of funny that Rio retrieved apples on a bird hunting trip. But all of us were happy to take a break to enjoy their juicy sweetness. All you have to do is wipe off the bird doo-doo, get out the pocket knife, and cut slices for everyone. Even Cooper took a slice when he saw all the other dogs enjoying them. Cooper has not yet had his hunting “lightbulb” moment this year. We really need to get him out somewhere, like a game preserve, where we can arrange for birds to be planted in identified locations. 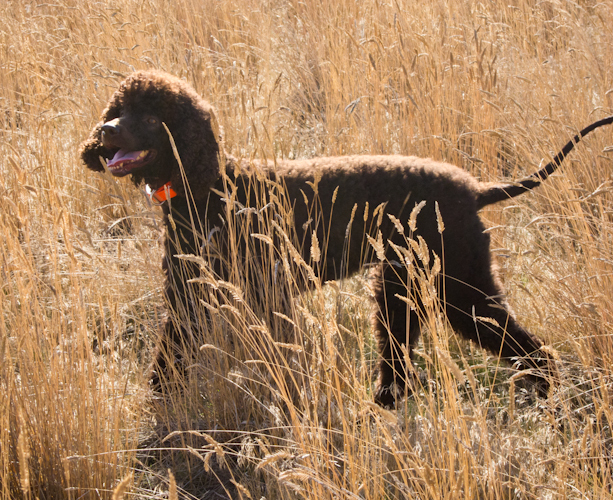 That way, we can direct Cooper to those birds so that when he flushes one, he can associate the excitement of the flush and retrieve with the birds’ scent and typical hiding places. Today, he mostly wanted to stay close to Russ, or to come find me. He’s birdy, though, so I know that with more experience, it’ll come. I was very pleased with Tooey. We haven’t taken her out hunting before, so she doesn’t have a clue about what she’s supposed to be doing out there. But she clearly enjoyed herself. She checked in with us often, but she was also pretty adventurous, searching the rocks and bushes for whatever was out there. And the water… Tooey loves to swim — she’ll swim just for the unadulterated joy of it. And the Lower Goose Lakes area is filled with, you guessed it, lakes. Little lakes, strung like beads along desert canyons. Whenever we couldn’t see Tooey, all we had to do was listen for the sound of splashing and paddling. If we heard that, we knew Tooey was swimming again. And loving every minute of it, even in the cold water on a cold November day. And then, after all the day’s fun, the not-so-fun. The plants in the field provide cover for birds and are wonderful to the nose. But they also festoon the dogs with seeds, twigs, seeds, thorns, and more seeds. And every single bit has to be picked or brushed out. Especially, I’m told, the cheatgrass seeds. For some reason, cheat grass seeds love to hide between dog toes, and in the ears, eyes, and mouth. They can even work their way through the skin into body cavities such as lungs and abdomen and cause serious infections as they move though and get lodged in body tissues. Nasty. So before dinner, before changing clothes, before even a glass of Scotch, out come the combs and brushes.